Ice crystals This page is primarily about vapour condensation to form (liquid) droplets. The two mechanisms discussed for droplets also apply to the growth of ice crystals, albeit with slightly different thresholds. However, a third mechanism exists for ice: ice crystals can—and often do—grow within a cloud of water drops owing to the difference in the equilibrium vapour pressure for the two states. Water droplets grow by the condensation of water vapour. There are two distinct ways for such condensation to come about: vapour cooling; vapour mixing. Typically, clouds well above the surface form as a result of vapour cooling—where different forms of cloud result from different cooling circumstances. 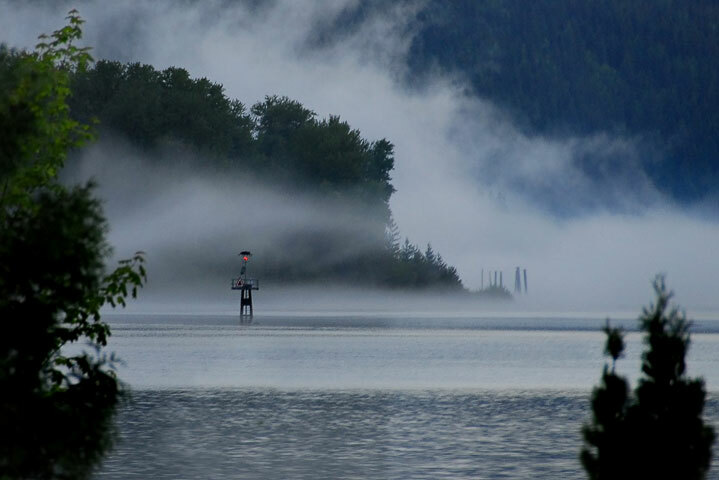 Typically, clouds (or fog) near the surface result from vapour mixing—where different forms of cloud result from different mixing circumstances. Dew forms from vapour cooling as does most frost, although some frost does form from vapour mixing. Almost all popular explanations of clouds assert: cold air cannot hold as much water vapour as warm air. This is used to explain cloud formation by cooling. It is true that some clouds result from cooling, but it is not true that this is because of a temperature–dependant holding power of air. That air isn’t involved has been known for two centuries. Alas, many teachers offer this bankrupt 18th century speculation. Some who know it to be false defend it as a simplification—it is not a simplification; it is simply bunk. It seems that although air does not have a holding power for water vapour, this nonsensical explanation does have a holding power for many teachers. Sigh…. It is atypical of this website to begin a page with a summary. Yet for the non physicist, the rest of the page gets a tad technical (for the physicist, it is trivial). So it seems worth offering results before reasons. What follows will be concise, but not short. The formation of clouds involves the interaction of water vapour and water in its condensed state—either liquid or ice. It helps to start by defining vapour pressure, equilibrium vapour pressure and humidity. The pressure exerted by water vapour. The atmosphere is made up of a mixture of gases: nitrogen, oxygen, argon, water vapour, carbon dioxide, and others. Each independently exerts a pressure, but when they are added together, they give the total atmospheric pressure—that quantity measured by barometers. The vapour pressure (or water–vapour pressure) is just the pressure exerted by the water vapour. As water vapour is a variable constituent in the atmosphere, the vapour pressure serves as a useful measure of the amount present. Many sources use the term, saturation vapour pressure, rather than the term, equilibrium vapour pressure. The saturation terminology is a throwback to the 18th century speculations. Saturation is as irrelevant as is the air. The value of the vapour pressure for which the flow of water molecules from the vapour to the liquid is equal to that from the liquid to the vapour. When the vapour pressure exceeds the equilibrium value, there is net condensation, when less, there is net evapouration. Vapour pressure is in kilopascals (kPa). By comparison, a typical atmospheric pressure might be ~100kPa. The line shows the equilibrium vapour pressure for flat pure water. Its slope is important for clouds formed by cooling; its curvature, for clouds formed by mixing. The blue dot represents some real condition, in this case a temperature of 10°C and vapour pressure of ~6kPa, or a humidity of ~50%. Imagine a surface of water, such as a pond. Below the surface the water is liquid; above the surface the water is vapour. Water molecules are constantly escaping the bonds of the liquid and becoming vapour; this is evaporation. The rate of evapouration depends upon the characteristics of the liquid: its temperature, dissolved impurities, shape (surface curvature). Water molecules in the vapour collide with the liquid surface and are captured; this is condensation. The rate of condensation depends upon the vapour pressure. 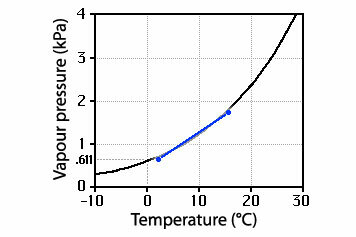 The vapour pressure at which condensation is equal to evapouration is the equilibrium vapour pressure. Teachers who speak of air becoming saturated with water vapour are hard pressed to explain why it is that the saturation is different in the presence of ice—or that water shape and purity changes it further. How could such things change the characteristics of the air? Well, they don’t; despite such silly claims, the air is uninvolved. Of course teachers who taught Dalton’s Law—gases in a mixture behave independently—then contradicted themselves with nonsense about the holding power of air for water vapour. It is just a case of rote learning leading to rote teaching. The value of the vapour pressure for which the flow of water molecules from the vapour to the solid is equal to that from the solid to the vapour. For ice and liquid at the same temperature, the evapouration rate from ice is less than that from (liquid) water. This is because the molecular bonds in the ice are greater, so it doesn’t take as high a condensation rate (from the vapour) to balance that evapouration. So, at a common temperature, the equilibrium vapour pressure over ice is less than that over liquid water. And, yes, ice and water can exist at the same sub–zero temperatures; indeed, such supercooled water droplets are normal in the atmosphere. Some sources suggest that humidities greater than 100% aren’t possible—an assertion which is not only physically false, but contrary to logic. It is true that humidities greatly in excess of 100% are uncommon if only because the resulting net condensation reduces the vapour pressure. But humidities somewhat greater than 100% occur frequently. Indeed, if they didn’t occur, there would be no clouds, no fog, no rain, no snow, no dew, no frost. The water cycle (and life on Earth) would cease. The humidity is just the ratio of the vapour pressure to the equilibrium vapour pressure, expressed as a percentage. So, if the vapour pressure is half the equilibrium value, the humidity is 50%. While people often speak of the humidity of the air, the concept is actually independent of those other gases; it is a characteristic of water. The statements above translate into: when the humidity is less than 100% there is net evapouration; when the humidity is more than 100% there is net condensation. When the humidity is identically 100% there is neither. 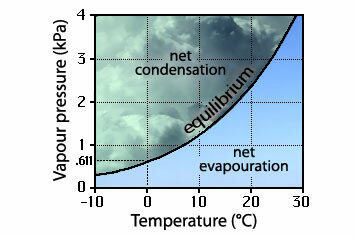 When the vapour pressure exceeds the equilibrium value, there is net condensation and a cloud can form; where it is less, there is net evapouration and a cloud would dissipate. By this, I don’t mean the geographically location, but the position on the diagram of vapour pressure and temperature. Under what meteorological conditions do clouds form. This does not say how those conditions are obtained, merely what they are. Where the vapour pressure exceeds the equilibrium vapour pressure, there will be net condensation; where it is less, there will be a net evapouration. A cloud (or fog, or dew, or frost) would be expected to form in the region of net condensation; a cloud would be expected to vanish. The question of cloud formation is now reduced to a discussion of the meteorological processes which will move the properties of the water vapour from the right side of the curve to the left side of the curve. There are two ways this happens in nature: cooling; mixing. Cooling can move the point which characterizes the vapour to the left of the equilibrium vapour pressure curve and condensation can begin. When vapour is cooled, eventually there will be condensation. Indeed, vapour cooling is the dominant way clouds form well above the Earth’s surface. This mechanism of cloud formation depends upon the slope of the equilibrium vapour pressure curve: it weren’t sloped, the cooling vapour would not move across it. Mind you, there are a couple of different ways cooling takes place and the two paths on the diagram differ somewhat. Yet in either case, condensation can occur. Incidentally, the equilibrium vapour pressure curve does not present a barrier, it merely marks the transition from net evapouration to net condensation. When two quite different parcels of vapour (the blue dots) are mixed the resulting mixture will lie somewhere on a straight line (the blue one) between them. It is possible for portions of the line to cross the curve, with the result that there will be net condensation giving a cloud or fog. 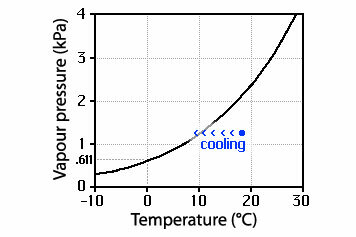 When two different parcels of vapour are mixed, it is possible for the resulting mixture to lie on the net–condensation side of the curve, that is for the humidity to exceed 100% and for condensation to occur. The characteristics of the mixture will lie somewhere on the straight line joining the two original points, the position depending upon the proportions. As unlikely as this may seem, it remains that not only does it happen, but this is the major mechanism for the formation of clouds adjacent to the Earth’s surface. This mixing mechanism of cloud formation depends upon the curvature (not the slope) of the curve. Curvature is necessary for a line joining points on one side of the curve to cross through the other side. This is a distinctly different mechanism than the cooling one: condensation occurs even though there is no net cooling of vapour (their average properties are the same as before the mixing). Of course, with a different choice of vapour parcels to be mixed, other things could happen; a pre–existing cloud might even evaporate. In these yellowish boxes, I have criticized those teachers of science who present nonsense about cloud formation. Have I been too harsh on a profession, ostensibly concerned with learning, which hasn’t mastered these basics despite having had two centuries to work on it? Hmm…, I wonder. What I can say is that this site will not knowingly offer nonsense just to be consistent with schools. This is the essence: condensation results from two distinctly different processes: vapour cooling; vapour mixing. Yet, if this were all there was to it—if there were no other subtleties—there wouldn’t be the rich variety of clouds and fog we see in nature. Cooled water vapour can condense. It is simple; it is correct. It does’t cover all clouds, but it does cover those clouds previously explained with nonsense about the air and its holding power. Some of these other influences will be treated on the topical pages. This page was written as a way to avoid saying the same thing over and over on the other pages which treat clouds and fog. Those pages can now just reference this one. From water vapour to droplets.